← What Keeps You From Serving Fresh Fruit? America, the food industry tells us, is becoming “a nation of snackers.” We eat 20% of our food on what the insiders call “snack occasions.” 50% of our snacktime calories come from things we drink, mostly sugary sodas and fancy coffee drinks. We also tend to have things for our meals — from smoothies to Chicken McNuggets — which our grandparents would unhesitatingly identify as a snack rather than a meal. By identifying “snack occasions” by time rather than by food, it’s easy to finesse the fact that we’re eating a granola bar for breakfast, crackers and cheese for lunch, and pizza for dinner. It’s not all bad news, though. According to a study by NPD, fruit is now the number one choice for snacks. Chocolate comes in at number two and potato chips come in third in the snacking study. Americans are notorious on a global scale for being unhealthy eaters, and there’s some truth to that. Compared with Europeans, we’re less likely to cook fresh food, more likely to eat standing up, and far more likely to end up with heart trouble. That’s Americans as a statistic, though. We know that Fruti fans love fruit, and we’re glad you make fruit — as well as Fruti bars — a significant part of your snacking experience. 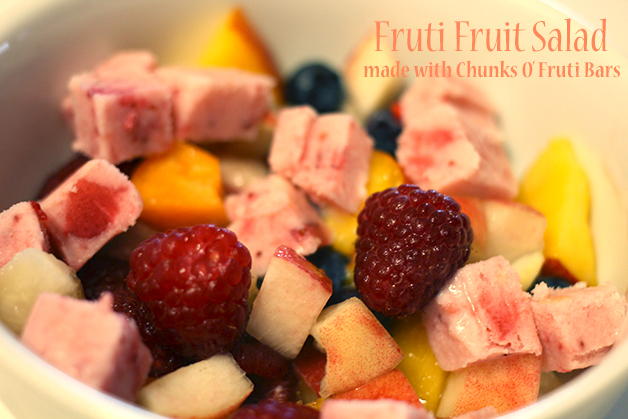 If you’re looking for new ways to try out fruits as a snack, try out this fun fruit salad twist for a hot summer day. There’s no need for any extra toppings like yoghurt, honey, or sugar syrups because these summer fresh fruits have all the sweetness you need! If you’re looking for a creamy taste, you can use one of our cream flavored Fruti bars, like the Strawberry Cream we used in our Fruti Salad. Wash your fruit, remove the stones or pits, and cut up your fruit into small pieces. Then cut up your Fruti bars into bite-sized squares. Combine together in serving bowl and enjoy! 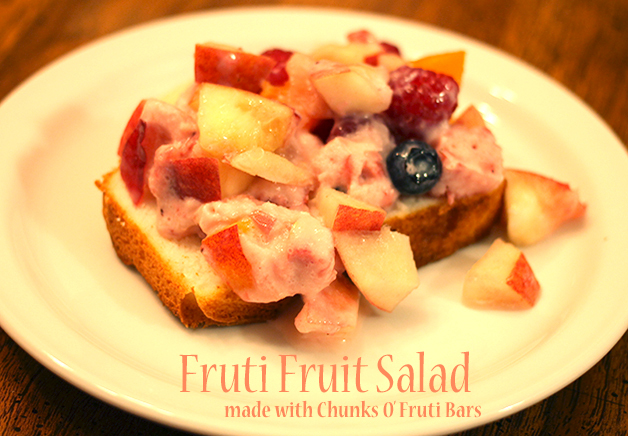 You can eat the Fruti fruit salad by itself or on top of a slice of pound or angel food cake. You can pick whatever combination of fruits are in season in your area and pair them with a Fruti bar. Try Pina Colada bars with pineapple and mango for a more tropical fruit salad. This looks delicious! Thanks for linking up at what i am eating!